What is the best way to indicate edit-in-place functionality on a list view in a responsive web application? This is an in-browser application designed for mobile (not a native mobile app), so cross-platform compatibility should be kept in mind. Apart from viewing the list of employees, the primary actions to be taken from this screen are calling and texting. The Edit action isn't a primary action so given the amount of screen real-estate, I think that showing the pencils is too cluttered. On Android, editing a contact requires you to navigate to the contact view first then tapping the edit button on the action bar. This makes sense as there are many contact details. For the Alarm Clock application on Android, long-pressing on the alarm will bring up a modal menu with Edit Alarm and Delete Alarm. The Edit alarm button takes you to a new screen, again logical because there's numerous fields. There's also a mass-delete option that brings up checkboxes beside all of the alarms you wish to delete. Tap on the list item to expand the item as described above. I'm not sure about the affordance of this option. 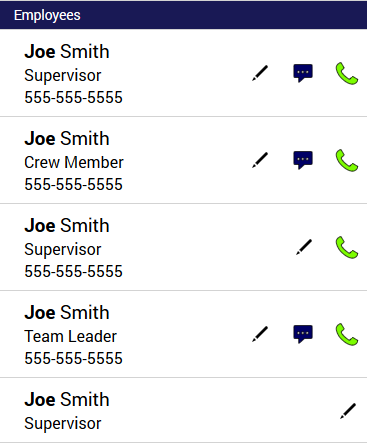 Use a vertical ellipses to the right of the Call button that opens a flyout menu with two options: Edit and Delete. Option 3: Use a vertical ellipses to the right of the Call button that opens a flyout menu with two options: Edit and Delete. Mainly because this option is the one least likely to result in accidental deletes or unintentional entry to edit mode, but also because these are less common secondary actions but which still need to be discoverable. But I'd also leave a clear space between the call button and the vertical ellipsis so that it's distant from the most common primary actions - again to avoid mis-tapping. The UX solution for View/Edit may be different depending on which of the three above is the highest priority, as there is always a balance between easy editing and preventing screw ups. Some say it is better to make it difficult for users to edit data to prevent them from making mistakes. However, if a user has been given the permissions to edit the data in the first place, you must presume that said user has the intelligence and expertise to be entrusted with making changes to that data: Making something difficult to do is never a proper UX solution. I personally like the technique used where the information is presented in a "View" state until a user hovers over an input. Then, an input bounding box is revealed, which shows the user that the information is editable. ON click, the cursor is placed inside the input, allowing the user to modify or enter data. Lastly, when the user exits focus and leaves the page, a confirmation message is presented showing the user the change that was made, allowing them to confirm or delete the change(s). This solves all three big rules, while sacrificing none of them: The data is easy to view/read. The data is easy to edit (onfocus/onclick) and unwarranted changes are prevented (confirmation message). Edit per feedback below... yes this is a web-only solution and doesn't work for mobile. How about a simple "Employees - tap to edit" header and table items that instantly go into edit mode when clicked ? UI trends are such that most displayed elements now offer some sort of interactivity so it is likely that users will try or at least be comfortable clicking on the table items and discover that they instantly go into edit mode, i.e. consistently with the suggested header. Not the answer you're looking for? Browse other questions tagged buttons mobile-web affordance inline-edit or ask your own question. Should the order of add / edit / delete buttons be based on the frequency of their use?